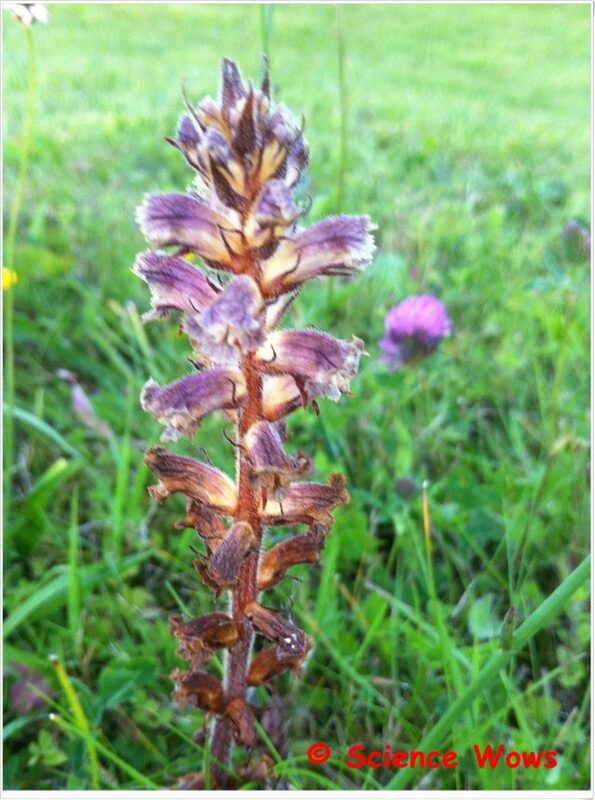 I came across this broomrape while cutting the grass today. Broomrapes are parasitic plants of the family Orobanchaceae. The broomrape I found in my garden in a Common Broomrape, parasitic on the root of a number of specific plants, particularly clover (as seen in the background of the photograph). The stem of the plant is reddish brown in colour and the flowers are white and purple. There are no true leaves, instead there are triangular shaped scales.All broomrapes lack chlorophyl, the pigment necessary to allow a plant to generate its own food by photosynthesis. It is this lack of chlorophyl that makes these plants parasitic, needing to rely on other plants for all their nutritional needs. Broomrapes are parasitic on the root of other plants, often just one specific plant, this may be reflected in the name of the broomrape, for example Ivy Broomrape or Thyme Broomrape which are parasitic on the root of the ivy plant or wild thyme plants, respectively. Although these plants are considered quite orchid like they are actually more closely related to the foxglove.